October so far has been a whirlwind of a month for me and seems set to continue that way! Staying centred while in the centre of a whirlwind takes a strong centre to return to! This is part of my feminine essence core cultivation practice. Having this practice (and it does take conscious, yet joyful practice), has helped me drop my awareness down and inward, to the stillness and depth of my centre so that I can truly listen to a deeper wisdom that calls beneath the flotation of thought. It’s a powerful anchor in times of chaos to have an inward ‘home’ to return to. And feminine essence cultivation acts as a compass to navigate there. Developing this connection also calls us into our authenticity as women to feel the truth of the moment so that we can act upon a deeper voice that tries to be heard. 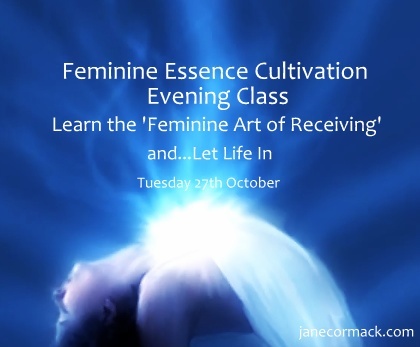 Next week on Tuesday the 27th of October from 6.45pm, I invite you to a ‘Feminine Essence Cultivation Evening Class ~ Learn the Feminine Art of Receiving’. During this evening class we will focus on the ‘Feminine Art of Receiving’. We will witness where we are open and closed to receiving what we truly desire while also developing a strong core connection to our feminine essence. A powerful, feminine woman is comfortable with attention directed towards her; many women are starving for healthy attention, yet do not allow, or feel comfortable letting it in. This is a one of a kind themed class that falls on the October full moon, so it will be even more potent! To get more details of the evenings and book your place in advance go here > 27th October Feminine Receiving Class. Then from November 11th on Wednesday evenings I’m offering the last 5 week class series of 2015! During autumn and winter, it’s incredibly nourishing to feel the deep connections made and the uplifting love from a circle of women. Each class of this series will focus on a particular component of feminine essence cultivation, delving into a body of work that has helped women the world over to feel safe, supported, seen, heard, more confident, encouraged and heart connected within a sisterhood of women. This will be an intimate circle so places are limited and an early booking discount is offered to those who book by November 6th. 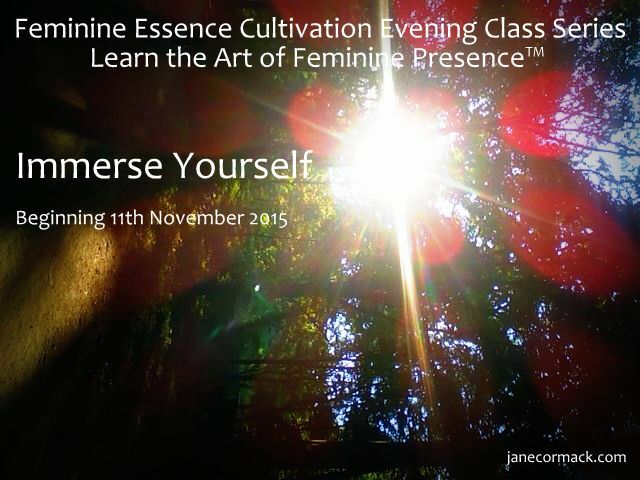 There is much more material to read on the details of these classes so if you feel a spark of interest, curiosity or your intuition is ignited, find out more here > Feminine Essence 5 Week Immersion and then contact me directly to book your place.